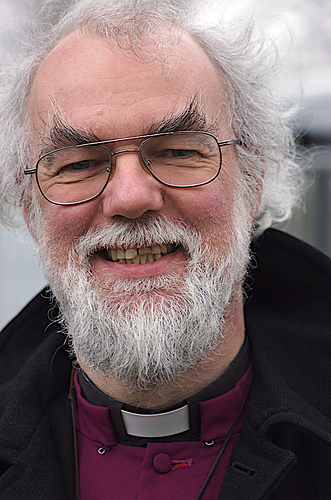 The Archbishop of Canterbury, Dr Rowan Williams is guest editor of this week’s New Statesman. The edition, which focuses on David Cameron’s “big society” policy, features contributions from Philip Pullman, A S Byatt, Gordon Brown, and Richard Curtis, as well as analysis and commentary from the Chief Rabbi, Jonathan Sacks, Maurice Glasman and Iain Duncan Smith. Willliams’ guest editorship has also resulted in a focus on faith: Pullman, author of the His Dark Materials trilogy, explains why he is a “Church of England atheist” and author Terry Eagleton writes about secularism. There are contributions from two vicars as well as actor Tom Hollander, who plays a vicar in television series Rev. Film director Richard Curtis writes about the scourge of malaria; and poker player and columnist Victoria Coren addresses “the vexed question of faith versus poker”. Novelist Byatt contributes a short story written especially for the edition. New Statesman editor Jason Cowley said: “I have long admired Rowan Williams as a thinker and public intellectual. His previous contributions to the magazine under my editorship have been both thoughtful and thought-provoking. We agreed that he would guest-edit the magazine over lunch at Lambeth Palace in January; we have been working on the issue ever since. Williams is the magazine’s fifth guest editor, following Alastair Campbell, Ken Livingstone, Melvyn Bragg and Jemima Khan. Image by Steve Punter on Flickr. Some rights reserved. This entry was posted in Magazines, Politics and tagged archbishop of canterbury, big society, guest editor, religion, rowan williams, the New Statesman on June 6, 2011 by Joel Gunter. Culture secretary Jeremy Hunt will say today that he intends to make the provision of local content a condition of the licences given to commercial broadcasters like ITV, Channel 4 and Five. In a speech today to the Royal Television Society, Hunt will also tell those channels with a public service broadcasting remit (PSBs) that retaining a prime position in the Electronic Programme Guide or future equivalent would depend on their commitment to “content with a social or cultural benefit”. I will begin the process of redefining public service broadcasting for the digital age by asking Ofcom to look at how we can ensure that enough emphasis is given to the delivery of local content. Of course not all PSBs will want, or be able, to be local broadcasters. But I’m determined that we should recognise the public value in those that do. If we remain centralised, top-down and London-centric – in our media provision as in the rest of government – we will fail to reflect the real demand for stronger local identity that has always existed and that new technologies are now allowing us to meet. Hunt will add that he has been “strongly encouraged by the serious thought that the BBC has been giving to how it might partner with new local media providers”. They will be astonished to find that three out of five programmes made by our public service broadcasters are produced in London. They will note that there is nothing but national news on most of the main channels, beamed shamelessly from the centre. And they will discover token regional news broadcasts that have increasingly been stretched across vast geographical areas – with viewers in Weymouth watching the same so-called “local” story as viewers in Oxford. Viewers in Watford watching the same story as viewers in Chelmsford. And able to exploit the potential of new platform technologies such as YouView and mobile TV to grow their service and improve their cost-effectiveness. In June, Hunt scrapped plans for new local news networks set up by the previous government. Hunt called the plans for Independently Funded News Consortia (IFNC) in Tyne Tees and Borders, Scotland, and Wales “misguided” and claimed they “risked turning a whole generation of media companies into subsidy junkies, focusing all their efforts not on attracting viewers but on persuading ministers and regulators to give them more cash”. This entry was posted in Broadcasting, Business, Politics and tagged BBC, big society, Broadcasting, Channel 4, culture secretary, electronic programme guide, Five, ITV, Jeremy Hunt, local tv, psb, public service broadcasters on September 28, 2010 by Joel Gunter.